Wishing everyone a happy and productive 2014!! I've got several projects on tap for this new year that I hope to share with everyone. I would also like to remind and encourage everyone to try their hand at the Write In The Dead Of Winter short fiction contest (see the page tab below the banner) as well as share your thoughts on what you thought were the best moments in the paranormal, horror, sci-fi, etc. for our Best of 2013 vote. Have fun, be safe, and enjoy the NEW YEAR! Tales go back more than a century of a misty, ephemeral giant that haunts the heights of Scotland's Ben Macdhui, the second highest summit in that country's Cairngorm mountains. 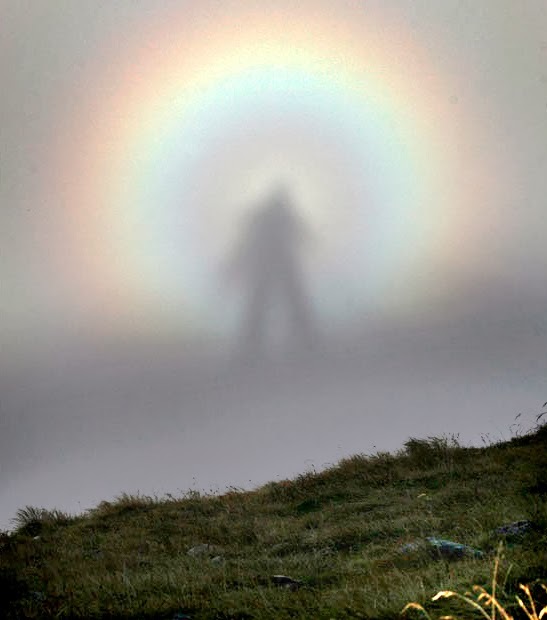 Known as the 'Grey Man' (or Fear Liath Mhor in Gaelic), the entity has been described a vaguely manlike figure born of mist that frightens hikers, forcing them to become lost or fall off a cliff. Other tales have told of attendant music and giant footprints as well. One of the earliest sightings of the Grey Man may have been by one Professor Norman Collie who related his encounter to members of the Cairngorm Club in 1925. Collie recounted how in 1891, as he descended the peak of Ben Macdhui, he heard footfalls shadowing his own, but the spacing was such that Collie imagined the invisible companion's stride to be 3 or 4 times that of his own. He attempted to dismiss the sound as some peculiar distortion of his own footsteps but they appeared to be getting closer. In a panic, he raced precariously amid the boulders for 4 or 5 miles to the safety of the Rothiemurchus Forest. Collie would state thereafter that he no longer ascended the mountain alone. 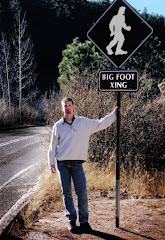 Around the turn of the 20th Century, a man named Henry Kellas was rumored to have seen a giant form on Ben Macdhui, but his story could not be confirmed. He died climbing Everest in 1921. Avid climber and hunter Alexander Tewnion was surmounting Ben Macdhui in 1943 when he became caught up in a storm. He couldn't help but think of the legend of the Fear Liath Mhor as the mists swelled around him and a strange shape manifested itself therein. Tewnion grabbed his rifle and fired three times as the entity lunged toward him. Clearly bullets had no effect and so Tewnion turned and ran. In 1945, Peter Densham heard the same peculiar footsteps that so frightened Collie. He, too, fled the mountain in fear, which seemed odd to many given Densham's stalwart nature: he ran air rescue missions in the Cairngorns throughout the war. It should be noted that many of these encounters have occurred along the Coire Etchachan, a valley off Ben Macdhui's eastern slope. 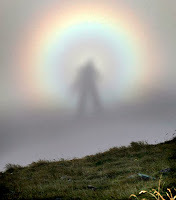 Some believe the legend is based in an atmospheric phenomenon known as a Brocken Spectre. This is when the sun casts shadows of hikers on nearby mists, making it look like a shadowy giant is lurking in the fog nearby. As for the footsteps, some attribute the sound to cryoseismic activity on the oft-frigid mountaintop. Additionally, the panic felt by these witnesses isn't new. "Climber's panic" often manifests itself as paranoia and can effect even seasoned mountaineers, becoming frightened, paranoid, and disoriented. However, this usually occurs on summits much higher than Ben Macdhui and is thought to be caused by a lack of oxygen. So, is the Grey Man legend all a mountaineer's tall tale spun to entertain his club or is there something lurking in the mists of Ben Macdhui? 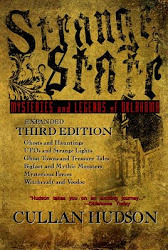 You're reading The Grey Man of Ben Macdhui by Cullan Hudson, originally posted on strangestate.blogspot.com If you enjoyed this post, be sure to check out the blog. Although this is from December of 2010, I think it is still a great jumping off point. Come on! If THIS doesn't get your creative story writing juices flowing, I don't know what will..."
Or anything else strange, dark, mysterious, horrific, otherworldly, paranormal and plain weird one might find in the dead of winter. Daniel ignored the sharp bite as the cold sunk deeper into his bones. The last of the pale light faded ghostlike beneath the thickening mass of snow laden clouds that triggered the street lights along his quiet street. 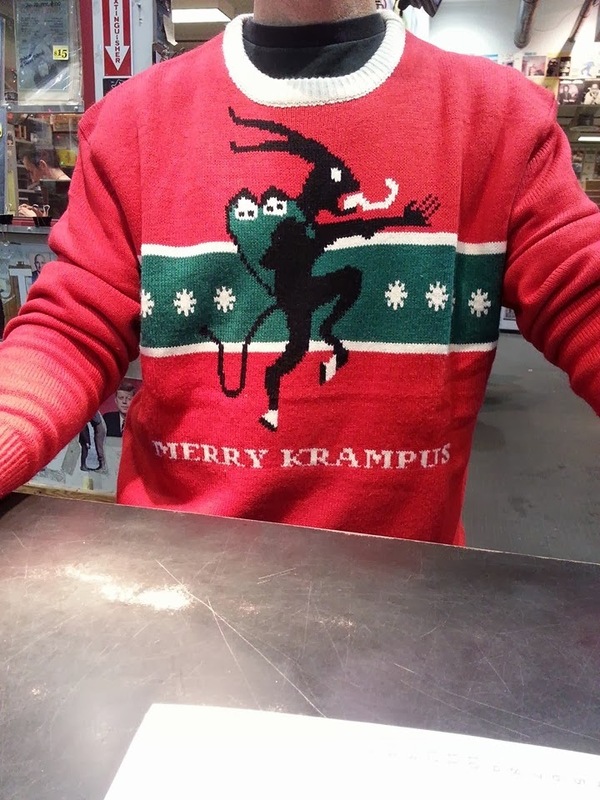 He scraped a mitten-covered hand across his red and dripping nose. Just a little more, he thought as he patted the rotund snow man in his front yard. He used the nut shells to fashion a wide grinning smile and added his sister’s red checked hat to the head. There, he thought. He looks good! Daniel stepped back, half turning, to see if his sister had a good sight of the round fellow. She waved from her chair by the window. Her leg in a heavy cast, there would be no snow ball fighting for her. Fists on his hips, he surveyed his creation and nodded. He bent to pick up the carrot and add the final touch to his snowman when he saw the neighbor’s yard next door. The house was dark as always. They never decorated for any holiday, but at Christmas it seemed they turned off even more lights. Now, in the front yard there was a figure shaped from the fresh snow. In Daniel’s yard, the bright white snow was fluffy and soft and could easily be rolled into giant balls for his snowman. Next door, however, the snow appeared darker, silvery. The neighbor’s snowman wore a black hat slanted down over its icy face and a satin scarf hung down the front. Its two arms were formed by the gnarled black branches of a dead tree. Daniel forced himself to look away; there was something disturbingly compelling about the figure. He felt so terribly cold, wanting nothing more than to go inside to warm up. But it was weird how he kept finding himself transfixed by the snowman. He twisted around in the snow and stomped up to the front door, willing himself to not look back as he rushed into the warmth and light of his home. At bedtime, the wind wailed as freezing rain peppered the darkness outside his bedroom window. Throwing back his covers, Daniel crept softly to the window and peered into the dark at his fat, jolly snowman. 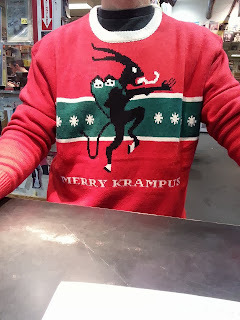 His sister had loved it and spent most of the night staring at it from the window near the fire. Something pulled his eyes and thoughts like a dark magnet toward the neighbor’s yard. Daniel jumped and fell back into the room. Heart pounding, he looked out the window again to confirm his initial impression. It was closer. The dark, icy column with its twisted arms, slanting black hat, and sinuous black scarf that whipped like a serpent in the freezing wind was no longer in the yard next door. It was a foot inside his own. It no longer stared blankly out to the street, but now its frigid face was facing Daniel’s own creation. The wind moaned and roared around the window like the cries of arctic beasts. Outside, ice-laden branches were the cracking bones of their prey. Chilled despite the warmth of the room, Daniel turned away, afraid of this icy intruder. It couldn’t be, he thought. I must have thought it was deeper into the neighbor’s yard that it actually was. Daniel mustered the courage to peek again into the frigid night. Each time Daniel looked away in chilled fear, he would turn back to find the snowman closer, its twisting arms reaching out. Suddenly, the bright red hat lifted off the head of Daniel’s snowman and fluttered about like a moth in the amber glow of the street lamp. Inches as a time, the dark, silvery column of ice moved closer. The red hat spun on the breeze and drew up above the black hat of the encroaching figure. It spun and twisted in the swirling wind until it was a ruddy blur. A black branch shot out from the neighbor’s snowman toward Daniel’s. A sudden icy rattle knocked at the window and the street light went out. Stillness came with the dark. Daniel found the sudden, searching quiet more unsettling than the roaring wind. He felt his heart pound as dared not breath. Daniel stood there in front of the window with the certainty that something crucial was happening outside in that cold, frozen night. He felt it breathing, he sensed it searching, and he knew it was waiting. Daniel couldn’t say how long he had stood there waiting, but his feet had grown cold. 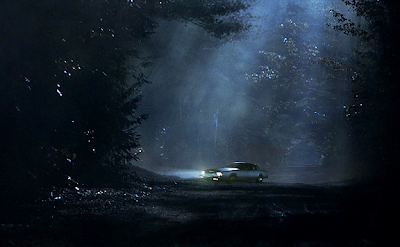 Still, he watched the black outside, searching with horrible anticipation for some sign of what was happening. In the pale silver light of dawn, details became manifest. An icy sheen covered every tiny branch and icicles hung like brittle fingers from gutters and roof and phone lines. A buttery sun fought to crawl through the crystalline clouds. He sought out the alien snowman, but could see no trace of it anywhere. “Danny!!! Oh, thank you Danny!” his sister was yelling from downstairs. She is going to wake Mom and Dad, he thought as he dashed out the room and down the stairs. “Cut it out, will you? You’re gonna get us in trouble.” He said as he came to where her makeshift bed had been made near the window. He walked to the window and pulled the curtains apart to reveal the scene. The snowman he had created in the middle of the yard now stood just outside the window. He was turned to face toward the window but it seemed he could also look at the yard. He seemed taller, straighter, and different. The bright red hat still perched on his head but across his front he held, like a soldier might hold a weapon, a gnarled and blackened length of branch. Around one end was tied, like a trophy, a length of shiny black satin. Here's your chance to vote for the best in paranormal, horror, and sci fi books, movies, television, and news over the past year. If you have a write-in, add it to the comments! 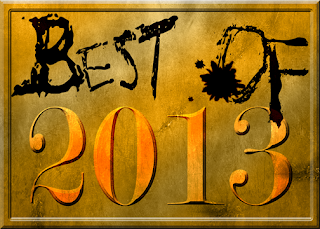 Just click the Best of 2013 tab beneath the header above to go to the interactive ballot. The code I put in the post doesn't seem to be working right. So, until I get that fixed, feel free to post your answers in a message. I will then tally them up the old fashioned way.